"Shelby Cobra" redirects here. For the 2004 Ford Shelby Cobra Concept, see Ford Shelby Cobra Concept. "Shelby 427" redirects here. For the NASCAR race that ran with this name in 2009, see Pennzoil 400. The AC Cobra, sold as the Shelby Cobra in the United States, is an Anglo-American sports car with a Ford V8 engine, produced intermittently in both the UK and the US since 1962. Like many British manufacturers, AC Cars had been using the Bristol straight-6 engine in its small-volume production, including its AC Ace two-seater roadster. This had a hand-built body with a steel tube frame, and aluminium body panels that were made using English wheeling machines. The engine was a pre-World War II design by BMW which by the 1960s was considered dated. Bristol decided in 1961 to cease production of its engine and instead to use Chrysler 313 cu in (5.1 L) V8 engines. AC started using the 2.6 litre Ford Zephyr engine in its cars. In September 1961, American automotive designer Carroll Shelby wrote to AC asking if they would build him a car modified to accept a V8 engine. AC agreed, provided a suitable engine could be found. Shelby went to Chevrolet to see if they would provide him with engines, but not wanting to add competition to the Corvette they said no. However, Ford wanted a car that could compete with the Corvette and they happened to have a brand new engine which could be used in this endeavor: the Windsor 221 in³ (3.6 L) engine – a new lightweight, thin-wall cast small-block V8. Ford provided Shelby with two engines. In January 1962 mechanics at AC Cars in Thames Ditton, Surrey designed the "AC Ace 3.6" prototype with chassis number CSX2000. AC had already made most of the modifications needed for the small-block V8 when they installed the 2.6 litre inline 6 Ford Zephyr engine, including the extensive rework of the AC Ace's front end bodywork. The only modification of the front end of the first Cobra from that of the "AC Ace 2.6" was the steering box, which had to be moved outward to clear the wider V8 engine. The most important modification was the fitting of a stronger rear differential to handle the increased engine power. A Salisbury 4HU unit with inboard disc brakes to reduce unsprung weight was chosen instead of the old E.N.V. unit. It was the same unit used on the Jaguar E-Type. After testing and modification, the engine and transmission were removed and the chassis was air-freighted to Shelby in Los Angeles on 2 February 1962, By this time the small-block's displacement was increased to 260 in3 (4.3 L). Shelby's team paired this engine along with a transmission into CSX2000, in less than eight hours at Dean Moon's shop in Santa Fe Springs, California, and began road-testing. Inboard brakes were moved outboard to reduce cost. The fuel tank filler was relocated from the fender to the center of the trunk. The trunk lid had to be shortened to accommodate this change. AC exported completed, painted, and trimmed cars (less engine and gearbox) to Shelby who then finished the cars in his workshop in Los Angeles by installing the engine and gearbox and correcting any bodywork flaws caused by the car's passage by sea. A small number of cars were also completed on the East Coast of the US by Ed Hugus in Pennsylvania, including the first production car; CSX2001. The first 75 Cobra Mk1 models (including the prototype) were fitted with the 260 cu in (4.3 L). The remaining 51 Mk1 models were fitted with a larger version of the Windsor Ford engine, the 289 cu in (4.7 L) V8. In late 1962 Alan Turner, AC's chief engineer completed a major design change of the car's front end to accommodate rack and pinion steering while still using transverse leaf spring suspension. The new car entered production in early 1963 and was designated Mark II. The steering rack was borrowed from the MGB while the new steering column came from the VW Beetle. About 528 Mark II Cobras were produced in the summer of 1965 (the last US-bound Mark II was produced in November 1964). In 1963 to keep production focused on producing cars for Shelby American Inc., the Ruddspeed Ace was discontinued. To supply cars to the European market, AC began to market and sell the Cobra in Europe. Advertisements from the time state that the Cobra was designed to meet the requirements of Shelby American Inc.
Shelby experimented with a larger Ford FE engine, of 390 cubic inches (6.4 L) in chassis number CSX2196. Unfortunately the car was not able to receive the development it needed, as resources were aimed at taking the crown from Ferrari in the GT class. Ken Miles drove and raced the FE-powered Mark II at Sebring and pronounced the car virtually undriveable, naming it "The Turd". It failed to finish with the engine expiring due to damper failure. CSX2196 was revised for the show down at Nassau which allowed a more relaxed class division of racing. This allowed the GT cobras to run with prototype Ford GT, GM Grand Sport Corvettes and Lola Mk.6. It was for this event in 1964 that the Fliptop cobra was used. An aluminium 390 cubic inches (6.4 L) engine was used. However, the car failed to finish. A new chassis was required, developed, and designated Mark III. 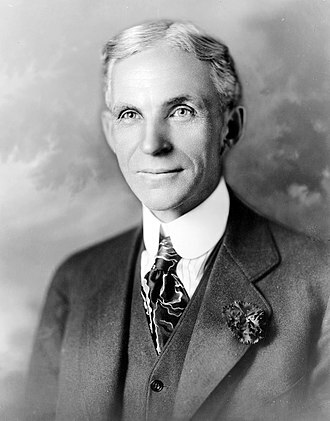 The new car was designed in cooperation with Ford in Detroit. A new chassis was built using 4 in (101.6 mm) main chassis tubes, up from 3 in (76.2 mm) and coil spring suspension all around. The new car also had wide fenders and a larger radiator opening. It was powered by the "side oiler" Ford 427 cu in (7.0 L) FE engine equipped with a single 4-barrel 780 CFM Holley carburetor rated at 425 bhp (431 PS; 317 kW) @ 6000 rpm and 480 lb⋅ft (651 N⋅m) @ 3700 rpm of torque, which provided a top speed of 164 mph (264 km/h) in the standard model and 485 bhp (492 PS; 362 kW) with a top speed of 185 mph (298 km/h) in the competition model. Cobra Mark III production began on 1 January 1965; two prototypes had been sent to the United States in October 1964. Cars were sent to the US as unpainted rolling chassis, and they were finished in Shelby's workshop. Unfortunately, The MK III missed homologation for the 1965 racing season and was not raced by the Shelby team. Only 56 of the 100 planned cars were produced. Of those, 31 unsold competition models were detuned and fitted with windscreens for street use. Called S/C for semi-competition, an original example can currently sell for 1.5 million USD, making it one of the most valuable Cobra variants. 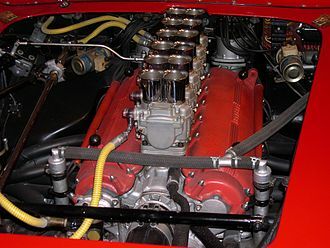 Some Cobra 427s were actually fitted with Ford's 428 cubic inches (7.01 L) engine, a long stroke, smaller bore, lower cost engine, intended for road use rather than racing. The AC Cobra was a financial failure that led Ford and Carroll Shelby to discontinue importing cars from England in 1967. AC Cars kept producing the coil-spring AC Roadster with narrow fenders and a small block Ford 289. 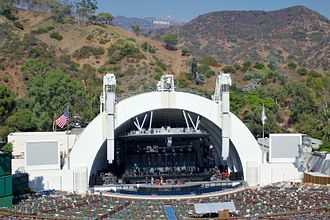 It was built and sold in Europe until late 1969. Shelby offered a drag package, known as the Dragon Snake, which won several NHRA National events with Bruce Larson or Ed Hedrick at the wheel of CSX2093. Only Six 289 Dragon Snake Cobras were produced by the factory. 2019, 2357 as factory team cars. 2248, 2416, 2427, 2472 as private team cars. One 427 Dragon Snake, 3198. Cobras were also prepared by customers using the drag package. Examples include: 2075, 2093, 2109, 2353, and 3159 "King Cobra." Designed for auto-cross events, only two examples were produced. Both had white exterior paint (with red racing strings) and red leather interiors. Equipped almost identically to CSX2522, this second example had aluminum valve covers, a tuned air cleaner, a Smiths heater, seat belts, front and rear brake cooling ducts, a hood scoop, brake cooling scoops, side exhausts and a painted roll bar (2522’s roll bar was chromed). Suspension options included Koni shock absorbers, front and rear anti-sway bars, unpolished six-inch magnesium pin-drive wheels, and Goodyear Blue Streak Sports Car Special tires. In 1966, CSX 3015 S/C was selected and converted into a special model called the Supersnake the "Cobra to End All Cobras." Originally part of a European promotional tour before its conversion. This conversion called for making the original racing model street legal with mufflers, a windshield and bumpers amongst other modifications. But some things were not modified, including the racing rear end, brakes and headers. The most notable modification is the addition of Twin Paxton Superchargers, TPS. Shelby crafted a second model, CSX 3303, from a street version. CSX 3303 was given to comedian Bill Cosby, his close friend. When Cosby attempted to drive CSX3303, he found that it was very difficult to keep under control; he later recounted the experience on his 1968 stand-up comedy album 200 M.P.H.. Cosby gave the car back to Shelby, who then shipped it out to one of his company's dealers in San Francisco, S&C Ford on Van Ness Avenue. S&C Ford then sold it to customer Tony Maxey. 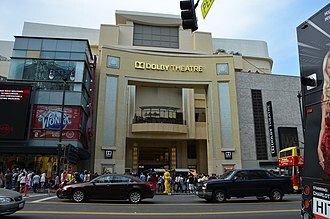 Maxey, suffering the same issues as Cosby did with the car, had his throttle stick while leaving a traffic stop, lost control and drove it off a cliff, landing in the Pacific Ocean waters. Shelby used his CSX 3015 as a personal car over the years, sometimes entering it into local races like the Turismos Visitadores Cannonball-Run race in Nevada, where he was "waking [up] whole towns, blowing out windows, throwing belts and catching fire a couple of times, but finishing." CSX3015 was auctioned on 22 January 2007, at the Barrett-Jackson Collector Car Event in Scottsdale, Arizona, for $5 million plus commission (£2.8 million), a record for a vehicle made in the U.S.
AC also produced the AC 428 Frua on a stretched Cobra 427 MK III coil spring chassis. The steel body was designed and built by Pietro Frua until 1973. 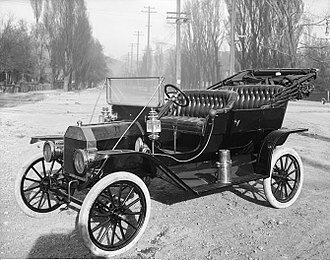 The American Electric Car Company used an even further modified chassis for their vehicles. One 96-inch prototype chassis (CSX 3063) was shipped to GHIA in Italy in 1965 for a body styling exercise. This vehicle was first displayed during a European car show with a Cobra license tag. An article about the car was written up in the Winter 65/66 edition of "Style Quarterly" magazine. Shelby American internal production records show that the car was shipped to Shelby American for Evaluation and review. AC Cars Ltd internal production records show that Shelby American placed an order for two 96-inch chassis (CSX 5001–5002) in 1966. AC labeled these chassis as "GHIA CONVERTIBLE" in their factory ledger. Shelby American internal production records show that the car was shipped to Shelby American for evaluation and review in early 1966. 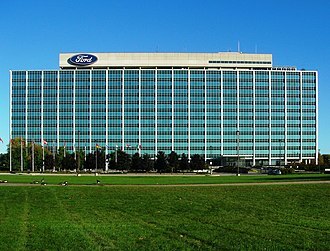 The vehicle was returned to Ford and now resides in the Detroit Historical Museum. By 1982, the AC name was licensed by Autokraft, a Cobra parts reseller and replica car manufacturing company owned by Brian A. Angliss. Autokraft also had acquired the company's tooling. Autokraft manufactured an AC 289 continuation car called the Autokraft Mk IV, basically a Mk III with a 302 cubic inches (4.95 L) Ford V8 and Borg Warner T5 Transmission. The Mk IV also received an independent suspension. In 1986, Autokraft (as a joint venture with Ford joining in 1987) purchased AC Cars, and produced the AC Mk IV Cobra, with a 250 hp (186 kW) at 4,200 rpm, 4,942 cc Ford V8, which provided a top speed of 215 km/h (134 mph) and 0–100 km/h in 5.2 seconds. At the 1990 Geneva Salon the Lightweight version was presented: weight was down to 1,070 kg (2,360 lb) (compared to 1,190 kg or 2,620 lb) and power was up to 370 hp (276 kW) at 5,750 rpm thanks to alloy heads, a Holley four-barrel carburettor, and no catalytic converter. While the Lightweight did not meet US federal regulations, the Mk IV did, and 480 cars of all versions were built until 1996. In 1996 the company was purchased by Pride Automotive. Two new 'Cobra' style cars were launched in 1997, the 'Superblower', an aluminium-bodied car with a supercharged 4,942cc Ford V8 providing 320 bhp and the cheaper 'Carbon Road Series' (CRS) with a carbonfibre body and a 225 bhp version of the Ford V8 engine. 22 Superblowers and 37 CRSs were built between 1997 and 2001. In 1999, a limited edition run of 25 289 FIA Cobras were planned. Only 1 example was manufacturered, chassis number COB 1001. A further variant, 'the 212 S/C' with a 3506 cc 350 hp twin-turbocharged Lotus V8 engine was introduced in 2000, but only two examples were built. In 2001, the company relocated its factory to Frimley, Surrey. By August 2002, the company was in a financial low and briefly acquired by Private Corp, who closed operations in October 2003. Only two models were produced, a FIA 289 (COX 2610), and a 427 Cobra (COX 3361). The cars were intended to be sold in the US market, through a new company, AC Cars USA, in Florida. Both cars were numbered following where the original ledger entries left off during the 1960s. On July 8, 2002, a new company was formed in Malta named AC Motor Holdings and was responsible for the branding of the company. In late 2003, the Frimley factory was under the control of AC Motor Holdings. On December 4, 2003, Shelby and AC announced a co-production of the CSX1000 and CSX 7500 series. Only 14 CSX1000, and 2 CSX 7500 cars were built by 2007. Between 2004 and 2007, AC Motor Holdings produced the AC Mk V in their Malta factory. However, only 3 right-hand drive and 2 left-hand drive carbon-fibre AC Mk Vs powered by 340 bhp 5-litre Ford V8 engines were built before the Maltese operation closed. On April 20, 2008, AC announced its Heritage Series, the UK operations were granted to Brooklands Motor Company, dba AC Heritage. The US operations were granted to AC AutoKraft, Llc, of Michigan. Both companies are licensed to produce traditional aluminum-body models: Ruddspeed, 289, and 427 continuation Aces and Cobras. In 2009, AC licensed Gullwing GmbH in Germany, dba AC-Automotive, to produce the AC MK VI, with an aluminium coated composite body and powered by a 6.2-litre 440 hp LS3 Chevrolet engine, or a 550 hp supercharged version. In 2012, the AC Mrk II Classic was released. Available in either aluminum or fiberglass bodies. In 2017, the AC Mrk1 260 Legacy edition was released in a limited production of nine cars. Also released was the AC 378 a newer composite body version of the Cobra. In an effort to improve top speed along the legendary Mulsanne Straight at the 24 Hours of Le Mans race, a number of enclosed, coupe variations were constructed using the leafspring chassis and running gear of the AC/Shelby Cobra Mark II. The most famous and numerous of these were the official works Shelby Daytona Cobra Coupes. Six were constructed, each being subtly different from the rest. AC Cars also produced a Le Mans coupé. The car was a one-off and was nearly destroyed after a high-speed tire blow-out at the 1964 Le Mans race. The car was qualified conservatively second in GT. The race started well with the AC, chassis number A98, maintaining its position in the top two in GT and even leading the class for a time. This was not to last as an act of sabotage (newspaper in the fuel tank) began to block the fuel filter. The car lost time until this was diagnosed and cleaned out. The car proceeded on at the predetermined conservative lap time and for the next stint remained trouble free. The car was able to match the Shelby Daytona's speed despite running a higher differential ratio (2.88 instead of 3.07) and a lower state of engine tune for reliability (355 hp instead of the Daytona's 385 hp). The Willment race team became interested in Shelby's Cobra-based coupe and inquired on purchasing one. Shelby turned down the offer, but supplied the drawings to Willment. Dubbed the Willment Cobra Coupe, this car was fully built by the JWA racing team and numbered 2131 on the frame. A prototype (CSX 3027) was to become 427 Coupe, but since the focus was shifted towards the GT program, this project received little attention. The bodywork and chassis were soon scrapped. Two further chassis were ordered number CSX 3054 and CSX 3055. This project was also abandoned with just CSX 3054 receiving a body. CSX 3055 was sold to the Willment Race Team and was fitted with a Fiat body designed by Ghia. In 1993 the Los Angeles Times exposed a Carroll Shelby scheme to "Counterfeit" his own cars. With the price of an original 427 c.i. Cobra skyrocketing, Shelby had, by his own written declaration executed under penalty of perjury, caused the California Department of Motor Vehicles (the government agency responsible for titling vehicles and issuing operator permits) to utter forty-three "Duplicate Titles" for vehicles that did not officially exist in company records. A letter from AC Cars confirmed the fact that the chassis numbers Shelby had obtained titles for were never manufactured, at least by AC Cars. Only fifty-five 427 c.i. Cobras had been originally produced out of a block of serial numbers reserved for 100 vehicles. Shelby had taken advantage of a loophole in the California system that allowed one to obtain a duplicate title for a vehicle with only a written declaration, without the vehicle identification number appearing in the DMV's database or the declarant ever presenting an actual vehicle for inspection. Shelby admitted that the chassis had been manufactured in 1991 and '92 by McCluskey Ltd, an engineering firm in Torrance, California, and were not original AC chassis, however Shelby denied having misled anyone and said he was a victim of a campaign by Brian Angliss, a British competitor, who was building a Cobra replica and wished to enhance his sales by smearing Shelby's car. Since the late 1980s onwards, various companies have built what are known in the hobby as "Continuation Cars". Shelby authorized continuations of the original AC-built Cobra series. Produced in Las Vegas, Nevada, these cars retain the general style and appearance of their original 1960s ancestors, but are fitted with modern amenities. Initially the car everyone[who?] wanted in a Continuation was a 427 S/C model which was represented in the CSX4000 series. This was meant to continue where the last 427 S/C production left off, at approximately serial number CSX3660 in the 1960s. The initial CSX4000 series cars were completed from the chassis built by McCluskey Ltd as well as other new parts and reconditioned Ford engines. Given the value of the vehicle many "extra" cars have appeared over the years, even some sharing the same chassis number. 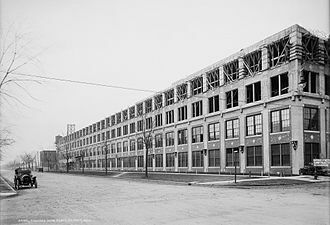 Gradually as the vintage parts supply ran low, newly constructed frames and body panels were obtained from a variety of suppliers. The production of chassis numbers CSX4001 to CSX4999 took roughly 20 years and many different business relationships to complete. In 2009, CSX4999 was produced, concluding the 4000 series. Production has continued with the CSX6000 serial numbers, featuring "coil over" suspension. The 289 FIA "leaf spring" race version of the car is reproduced as CSX7000, and the original "slab side" leaf spring street car is the CSX8000 series. The Daytona Coupe is reproduced as the CSX 9000 series. To date most continuations are produced in fiberglass, with some ordering cars with aluminium or carbon-fibre bodywork. In 2004, at the North American International Auto Show in Detroit, Ford unveiled a concept for a modernized AC Cobra. The Ford Shelby Cobra Concept was a continuation of Ford's effort to bring back the retro sports cars that had been successful in the 1960s, including the Ford GT40 and the fifth generation Ford Mustang. In 2014 Shelby American announced a limited edition production of 50 cars for the 50th anniversary of the original 427 Shelby Cobra. During the continuation period, Kirkham Motorsports were contracted by Shelby to produce rolling Cobra body/chassis units but this did not end amicably. Pete Brock said in a Hot Rod magazine interview "Like the Kirkhams, even when they were supplying most of Shelby’s Cobra parts. Shelby would go to them and say he would buy their entire year’s worth of production and sign a contract. They called me and asked if they should do it and I said, “As long as you get the money up front, but if you let a car out the door, you’ll lose money." Shelby paid that way for two years and then finally [Kirkhams] got a great big order and Shelby’s truck driver said he forgot to bring the check. He went back with a bunch of cars on the transporter and Shelby told them he wasn’t going to pay them—that they owed it to him. That almost put [Kirkhams] out of business." ^ a b "Shelby to produce Limited Edition 50th Anniversary 427 Cobra". www.gizmag.com. Retrieved 25 August 2018. ^ "Original 1965 Shelby 289 Cobra - Original Drivetrain Documented Full History". Legendary Motorcar Company Ltd. Retrieved 25 August 2018. ^ "1962 AC Cobra 260 car technical specifications from Carfolio.com – 2 door 4.2 litre (4265 cc) V8 263.6 PS, 4 speed manual". Carfolio.com. 22 August 2008. Retrieved 2 February 2011. ^ "1963 AC Cobra 289 car technical specifications from Carfolio.com – 2 door 4.7 litre (4727 cc) V8 274.8 PS, 4 speed manual". Carfolio.com. 22 August 2008. Retrieved 2 February 2011. ^ "1968 Shelby Cobra 427 car technical specifications from Carfolio.com – 2-door 7-litre (7010 cc) V8 359.9 PS, 4-speed manual". Carfolio.com. Retrieved 2 February 2011. ^ Friedman, Dave (1994). "1". Shelby Cobra: the Shelby American color archives. MBI Publishing. ISBN 978-0-87938-757-0. ^ a b Bornhop, Andrew (May 2012). "Celebrating 50 Years of Shelby". Road & Track. 63 (9): 52–61. ^ Dennis Begley, ed. (March 8, 2005). "Cobra Specifications". thecarsource.com. Retrieved June 23, 2018. ^ "1966 Shelby Cobra 427 S/C". Supercars.net. Retrieved 1 February 2011. ^ "1966 AC Cobra 427 S/C". Supercars.net. Retrieved 1 February 2011. ^ "Barrett-Jackson Lot: 1301–1966 Shelby Cobra 427 "Super Snake"". barrett-jackson.com. Retrieved 1 May 2011. ^ "Barrett-Jackson Classic Car Show and Auction – 1966 Shelby Cobra 427 Supersnake". about.com. ^ "Carroll Shelby's Super Snake Sells For Record $5 Million Dollars". mustangblog.com. ^ "Car goes for £2.8million". thesun.co.uk. London. 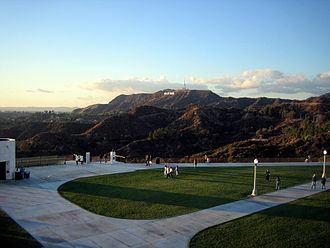 10 May 2007. Retrieved 4 January 2008. ^ "Cobra Ghia". www.ponysite.de. Retrieved 25 August 2018. ^ Site-Mechanics. "1965 Ford XP Bordinat Cobra - Concepts". www.carstyling.ru. Retrieved 25 August 2018. ^ Büschi, Hans U., ed. (1991). Automobil Revue 1991 (in German and French). 86. Berne, Switzerland: Hallwag. p. 151. ISBN 978-3-444-00514-5. ^ "Winning The Battle Against Vehicle Insurance Fraud: Glossary of Vehicle Insurance Fraud Terms" (PDF). preinsuranceinspection.com. Archived from the original (PDF) on 4 November 2011. Retrieved 29 May 2012. ^ a b c Dean, Paul (15 April 1993). "Car Trouble? : Autos: Questions have been raised over Carroll Shelby's claim he's building 43 of his classic Cobras using original chassis. Shelby says he's the victim of a business feud. April 15, 1993 PAUL DEAN TIMES STAFF WRITER". latimes.com. Retrieved 28 May 2012. ^ "Bringing back the beast: Shelby American to build 427 Cobra". Retrieved 25 August 2018. 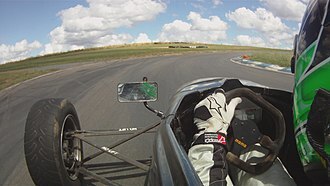 Wikimedia Commons has media related to AC Cobra. Fender is the American English term for the part of an automobile, motorcycle or other vehicle body that frames a wheel well. Its primary purpose is to prevent sand, rocks, fenders are typically rigid and can be damaged by contact with the road surface. Instead, flexible mud flaps are used close to the ground where contact may be possible and these materials can be ejected from the surface of the tire at high velocity as the tire imparts kinetic energy to the attached objects. For a vehicle moving forward, the top of the tire is rotating upward and forward, in British English, the fender is called the wing. In modern Indian and Sri Lankan English usage, the wing is called a mudguard, the term mudguard appears to have been in use in the U. S. at one point. White, in an October 1940 Harpers essay, Motor Cars, refers to. mudguards, in German, it is known as a Kotflügel. In the United States, a car accident is often called a fender bender. In current US auto industry nomenclature, usually only the panels over the front wheels are called fenders, the auto industry changed from rear fenders bolted onto a quarter panel to an enlarged welded-on quarter panel that fulfilled both functions. This resulted in one piece where there had previously been two, and name of the welded piece, the quarter panel, survived the consolidation. The bolted panel which covers the wheel on dual rear wheel pickup trucks is called a fender, a pickup truck with a separate bed but without bolt on fenders has a bedside, which performs the function of a fender. When the side of the bed is welded to the cab, as with the Cadillac Escalade and Chevrolet Avalanche, while the standard of bolted versus welded normally applies, there are some exceptions. Although attached by welding, the panels over the front wheels on cars such as the early 60s Lincoln Continental, the Corvair, even though bolted on, the panels covering the rear wheels on the Saturn S series are called quarter panels. The terms have evolved to be determined based on location. Quarter panels are at the rear, with a made for dual rear wheel trucks. For vehicles with a car body that exposes the tire. For wide body vehicles that cover the tire, the forms the wheel well surrounding the tire. The energy of motion is converted into waste heat which must be dispersed. Hydraulic disc brakes are the most commonly used form of brake for motor vehicles, compared to drum brakes, disc brakes offer better stopping performance because the disc is more readily cooled. As a consequence discs are less prone to the brake fade caused when brake components overheat, disc brakes recover more quickly from immersion. Most drum brake designs have at least one leading shoe, which gives a servo-effect and this tends to give the driver better feel and helps to avoid impending lockup. Drums are prone to bell mouthing and trap worn lining material within the assembly, the brake disc is usually made of cast iron, but may in some cases be made of composites such as reinforced carbon–carbon or ceramic matrix composites. This is connected to the wheel and/or the axle, friction causes the disc and attached wheel to slow or stop. The development of disc-type brakes began in England in the 1890s, successful application began in airplanes before World War II, and even the German Tiger tank was fitted with discs in 1942. The Jaguar racing team won, using disc brake equipped cars, mass production began with the 1955 Citroën DS. Development of disc brakes began in England in the 1890s, the first caliper-type automobile disc brake was patented by Frederick William Lanchester in his Birmingham factory in 1902 and used successfully on Lanchester cars. However, the choice of metals in this period meant that he had to use copper as the braking medium acting on the disc. The poor state of the roads at this time, no more than dusty, rough tracks, successful application began in airplanes and tanks before and during World War II. At Germanys Argus Motoren, Hermann Klaue had patented disc brakes in 1940, Argus supplied wheels fitted with disc brakes e. g. for the Arado Ar 96. The German Tiger I heavy tank, was introduced in 1942 with a 55 cm Argus-Werke disc on each drive shaft, the American Crosley Hot Shot is often given credit for the first production disc brakes. For six months in 1950, Crosley built a car with these brakes, lack of sufficient research caused reliability problems, such as sticking and corrosion, especially in regions using salt on winter roads. The Ford Shelby Cobra is a concept car that Ford unveiled at the 2004 North American International Auto Show in Detroit, Michigan. The Shelby Cobra concept is an inspired by the original AC Cobra that AC Cars developed in 1961. Fords Advanced Product Creation team designed and built the Shelby Cobra concept in five months, the project was led by Manfred Rumpel. Like several other Ford vehicles developed in the early 2000s, the Shelby Cobra concept is an interpretation of an older vehicle. In the case of the Shelby Cobra, the design is reminiscent of the AC Cobra MkI, the first Cobra featured a large, high-performance Ford Windsor engine inside a small roadster that AC Cars had modified at Shelbys request. Likewise, the Shelby Cobra concept car is small and minimalist, in a press release to announce the debut of the concept car in 2004, Shelby echoed the aim of the design team, Thats the formula Its a massive motor in a tiny, lightweight car. The Shelby Cobra concept features an all-aluminium, V10 engine, displacing 6.4 L and it is capable of producing 645 hp at 6,750 rpm and 501 ft·lbf of torque at 5,500 rpm, making the one of the most powerful engines built by Ford. The engine red-lines at 6,800 rpm, and Ford claims it is capable of reaching 267 miles per hour, the double overhead cam cylinder heads and cylinders are fed by port fuel injection and racing-derived velocity stacks that are just visible within the hood scoop. For a low line, the throttles are a slide-plate design. The lubrication system is the type, which relocates oil from underneath the engine to a remote tank. The chassis of the Shelby Cobra concept was based on a chassis used on the GT production car. 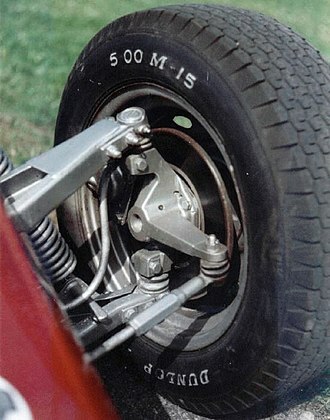 In fact, many parts of the GT were adapted for use in the Cobra, such as the suspension, several components of the frame, and the mounting brackets for the transmission. Despite sharing large portions of its chassis with the GT, the Shelby Cobra concept is almost 2 feet shorter, although the Shelby Cobra concept was aimed to reflect the design of the AC Cobra, the concept is dimensionally very different from the original. However, the design includes many common features, such as a large grille opening, side vents. Thames Ditton railway bridge-turned-viaduct is a landmark for its scale of brickwork and its layout (of a roundabout beneath it). 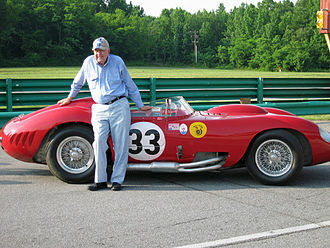 Shelby beside his 1957 Maserati 450S at Virginia International Raceway in 2007. Shelby racing an Aston Martin DBR1/300 at the 12 Hours of Sebring in 1958. The front of the Shelby Cobra concept.